The DCCB 2018-2019 Concert Season is Underway! with the Duke Wind Ensemble! Our first CD is proudly available! to Triangle area Middle & High School student musicians. Please download our application to learn more about this exciting opportunity. The DCCB includes members of ALL ages and ALL levels of musical talent. The band performs in Durham County, NC and the surrounding area at fairs, celebrations, hospitals, malls, sporting events, churches, parks and retirement centers. We play pops, marches, classical, semi-classical, Broadway and other popular music. Come join us! GREAT NEWS!! For those who shop at Amazon and would like to support DCCB, you can do so us via Amazon Smile. This program contributes a percentage of your qualified Amazon.com purchases, at No Cost To You, as a donation. Use the link below to login to your Amazon account, then when you shop, you will automatically be supporting us. It's easy as that! And, of course, we Thank You in advance for supporting the band. We look forward to being a continued integral part of your musical arts community. 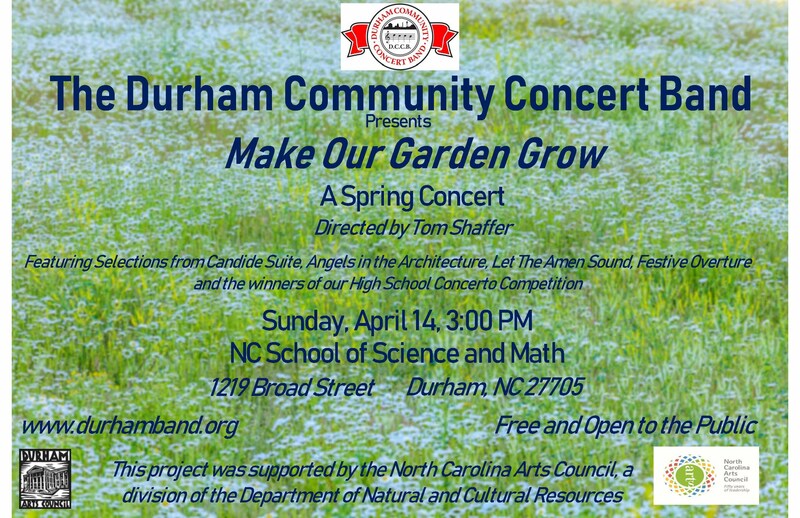 The DCCB's programs are made possible in part by the Durham Arts Council's Annual Fund, and support from the North Carolina Arts Council, an agency of the Department of Cultural Resources. Welcome to our new sponsor! - Digital Dentistry of Southpoint. Check our Calendar for Dates, Times and Locations of all upcoming Performances! We look forward to seeing you at ALL of our FREE concerts!